This is the test build of my latest kit but can you tell what it is? A few clues; Its smaller than a Wren, its not British and no-one has requested it, this is on my wants list. I hope others will want one or I will end up with more than I bargained for. I was hoping to have it ready for Burton in June but I'm not sure I will make that deadline, the test build will be on display though. If you know what it is, answers on a postcard to .... just email, its a lot easier. The first few correct answers will get a selection of my small bits in the post. No correct answers as of 30th March so I've added the latest pictures which look more like it should. Dimensions of the finished loco are length 75mm, height 55mm and width 36mm, it runs on 10.5mm wheels. There were 14 of the prototypes built, all for one major job. 9-4-2019 - 3 people came up with the correct answer, a Franco Belge 0-4-0WT as used to build the Panana Canal. I thought more people would have got it as there was an article in NG&IR and Paul Berntsen built one a little later which was also in NG&IR. The test build is on hold at the moment, too much other stuff to get finished including the masters for the 1/35th scale Peckett. If you want a Franco Belge, email and I will start a list. Completion is likely to be July/August this year. 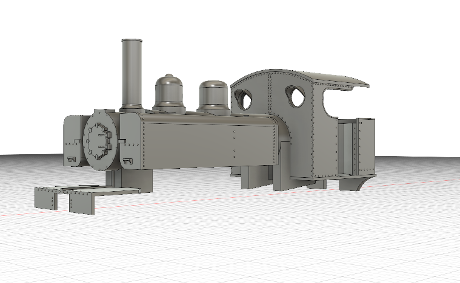 It is compensated, comes with a jig for assembling the axles and cranks, the valve gear will hopefully look like its working and it will be available for 12 to 16.5mm gauges, 10.5 & 9mm on request. The 14mm version is close to scale and all narrower gauges are achieved by moving the wheels closer together, the 16.5mm one though needs wider frames. This just looks silly as the gap between the boiler and cylinders is too wide. The solution is a larger boiler on the 16.5mm version only which fills the gap without upsetting the looks too much. Both boilers are in the kit as supplied. It can be built with or without the canopy type roof. I have told many people that I might get round to doing a kit for Hunslet WD 4-6-0 but never a Baldwin as I don't like them and didn't think they would pay their way. Then I got a call from an American called Dylan Lambert who wanted a Bachmann chassis converted to go under a 3D printed Baldwin body. I was interested to see the body and duly stripped all the running gear off the Bachmann chassis and reinstalled it on one I 3D printed to fit his body. It was a success but didn't look right so we got into discussions about how to improve the body with a view to turning it into a kit. Below are 2 shots of the finished Bachmann chassis bash. 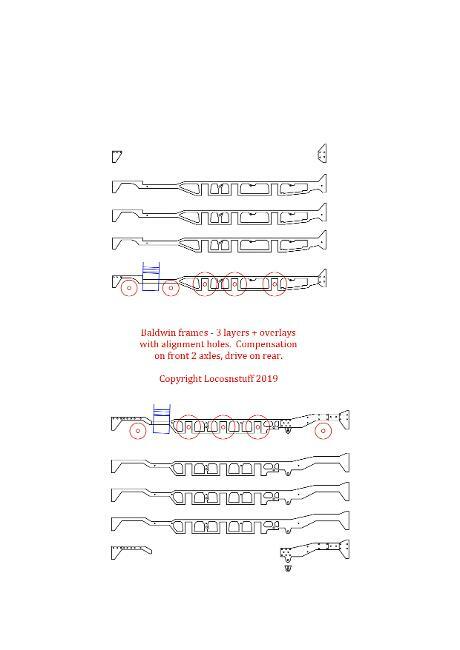 We decided that 2 versions would be required, a 2-6-2 for the US market and a 4-6-0 for WD modelers, fortunately the 2 used common parts for most body bits and I spent some time locating the differences. Dylan extended the rather short boiler and tanks and added all the rivet detail and beading. The chunky panels were slimmed down a bit and we decided that there would have to be 2 boilers as the fittings are different and 2 footplates as the 4-6-0 cab sits 13 inches further forward. 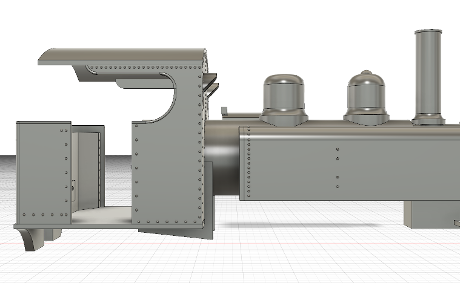 The body will be printed in sections which will be used as masters for resin castings, these include boiler, tanks, cab, bunker, cab footplate and roof which are glued together and detailed with brass castings and wire etc. There are slots for Kadee couplings and room for weight, DCC and sound. Below are two 3D renderings of the 4-6-0 showing the detail so far. Meanwhile I have been working on the frame design. It turns out that the only common parts on the chassis are cylinders and wheels, everything else was bespoke for each one. The sketch shows the frame layers and overlays which will be 1.2mm thick when assembled. They will be buildable to 16.5, 14 or 12mm but the 12mm option may need a different gearbox as my geared motors won't fit between frames that thick. There will be even more overlays for the spring and compensation lever detail which is prominent on the prototype. Its early days yet but I am hoping to get this project finished this year and the final product will be a full kit of either the 10-12-D 4-6-0 or the 10-12 1/4-D 2-6-2 in 12, 14 or 16.5mm gauges. Anyone know who chose to give the 2-6-2 a model number as silly as 10-12 1/4-D? I received the test etches for this kit a few days ago and have built most of it to make sure it works, also to use as a basis for the casting masters. It went together nicely and quicker than the 7mm version. This was also a good test for my WEP soldering iron which was turned up to 420C for some parts but coped admirably. The metal is 0.5mm thick which is a lot tougher to fold and curve than the usual 0.4mm. I could have used 0.4mm but would have had to have redraw most of the kit to allow for it, the original was drawn for 0.4mm but scaled up it needed 0.485mm, 0.5mm is the closest available. It just means that a few bits need the fold line eased with a triangular file before folding and full thickness parts needing rolling must be annealed first, this only applies to the roof and smokebox wrapper. Progress so far is shown below, strangely its quicker to build than the 7mm version. This is mainly due to the thicker etches and larger size, making it easier to clean up solder joints without risk of damage. I am hoping the kit will be available for Burton in June but I can't promise it. 10-4-2019 New picture added of the casting masters, despite being only 22% larger than 7mm, the level of detail achievable is noticeably better. They will go off for casting later today. I was asked to produce my Gamecock in 10mm scale and have a set of etches for sale. They will come with the instruction CD and I can print a scaled up firebox to suit, the rest is up to you. It has been pointed out to me that my Barclay chassis which is 7mm or 1:43 scale will actually make quite a good chassis for an O&K tank loco or similar in 1:35 scale. Well, I didn't see that one coming but in 16.5mm form it certainly will. I will have to try it myself. I bought an unknown vertical boiler loco body thought to be 1/35th scale on Ebay, it turned out to be a 7mm scale ETNA by Smallbrook Studios. Rather than use a Smokey Joe chassis, I printed one to fit and used my larger geared motor, 16mm spoked wheels and rods and cranks borrowed from one of my Pecketts. The result was surprisingly good, except that its more suited to 1/35th or 1/32nd scale. Its sort of an adaption of a De Winton but much bigger to fit the Hornby chassis. If anyone has an Etna that they would like to use for whatever scale but need a better chassis, I can build these to order. You get Scalelink wheels 16mm spokedand around 140:1 gearing with an N20 motor. The drive is smooth and silent and very good at slow speeds. Email for a price. This is a print from Tom Bell of Teebee models from Shapeways for which I printed a chassis for 14mm. Its not wide enough for 16.5mm so can only be gauged from 14 to 12mm but I can make achassis for 10.5 or 9mm if required. Cost in any gauge is £90 as the loco is fairly large and the print is around £36 on its own. These are 2 prints that Teebee models were selling in 5.5mm scale, so I asked Tom nicely and he made them available in 7mm. As they are scaled up from a smaller drawing they are not as detailed as some others but the body shape and finish is good. The floor and gearbox top were missing from the print so I incorporated these into the chassis. Due to a quirk of printing and pricing at Shapeways, the open cab version comes out dearer than the one with the cab but I will do them both at the same price of £90 complete. The standard chassis can be gauged from 16.5 to 12mm and I can make specials for 10.5 or 9mm. The couplings are a hangover from 5.5mm scale and most of us would cut them off and replace them with something more suitable. I added these to an etch for a friend who wanted 180 and I now have a lot spare. They were designed to be used double thickness with wire passed through the holes to create a fence, used double I have enough for 166 posts. They are 0.8mm wide so double are 0.8mm square, height above ground 13.5mm. These have finally arrived from China and they have surpassed my expectations. The gears are so well cut that they need no running in and just work perfectly from first fitting. They are 0.4 module 13:1 ratio, the gear is small enough to use with 8.5mm wheels and the worm is actually 2mm longer than the ones in the picture, they were a test sample. Both have 2mm tight push fit bores to suit my power bogies where they will be standard fitting from now on. The wheels are 10,5mm blackened steel but still conduct electricity, on turned plastic bushes with 2mm brass pin point, brass blind or steel blind axles. They are supplied loose so that I can choose the axle and they push on dead square every time, unlike some plastic centered wheels I have had to use lately. They are also perfectly concentric as they are CNC machined. The pulleys are much as my previous ones, no real changes there. The large one is bored 2mm and the small one 1mm, ratio around 2.8:1. All these are available separately, a gear set £3.50, 2 pulleys with 2 O rings £2.50 and wheels £2.50 per axle. The bottom picture shows the new wheels at the back, my previous ones in the middle and Gibsons at the front for comparison. Found by chance while looking for something else on Chinese websites. It turns out to be the best iron I have ever owned, mine has been in use for at least 4 months now and I still can't fault it. Its variable from 90 to 420 degrees with a temperature lock switch to avoid accidental adjustment, has the fastest warm up time I have ever seen, 0 to 360 degrees in around 20 seconds, It also does not loose temperature when soldering, even on a large piece with the biggest bit. It comes with a sponge tip wiper, a brass shavings tip cleaner, a solder reel support (not shown), 5 assorted bits and has a sleep function that lowers the temperature after 10 minutes of inactivity. Extra spare bits are universal to most Chinese irons and come in packs of 11. I have sold several now and highly recommend them. The irons come from a European warehouse so supplies are quick but the bits come from China and can take a month to arrive so I try to keep a few packs in stock.